Such pretty WIPs! No wonder you’re having a hard time knitting on the go with these. They’re all so lovely. Those are all lovely WIPs! I especially like the little cabled cardi. I must admit I’m a huge fan of vests for babies and kids — so practical. I just converted the Oz vest from Louisa Harding’s Natural Knits for Babies and Moms to knit in the round, and it was so much fun. 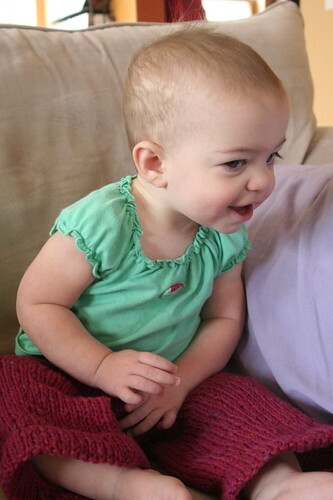 I’m about to start a vest for June (Blank Canvas Child’s Vest by Cari of Dogsstealyarn), I can’t wait! She only has one sweater vest (and it’s not handknit!) but she wears it constantly. It’s the perfect layer for in-between temps. But I can’t wait to see Beatrix’s cardigan! It’s looking very promising so far and YOUR vest is stunning! Great WIPs! I can’t decide which one I like the most. 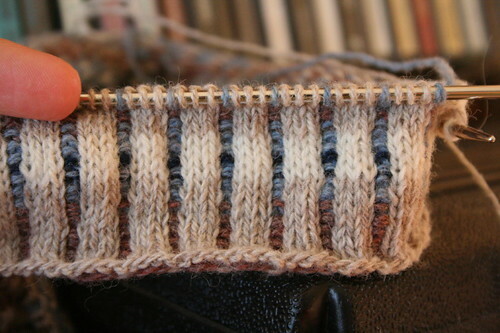 I really like the color substitutions you’ve made on your ILV – I can’t wait to see the FO! So many great projects. I love the soakers, who’d think diaper covers could be so cute. 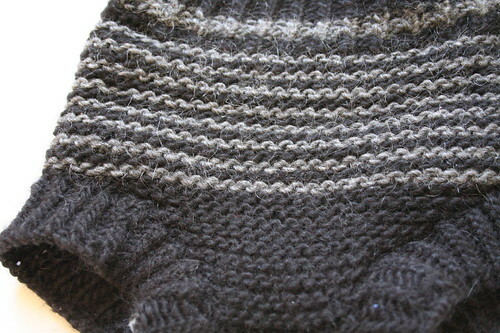 Don’t feel bad about that second sock – I only just finished mine today and the pattern was pretty easy to memorize. You have some great WIPs, I can see why it’s so hard to carry them around though. I love seeing your little wool soakers! Olive lived in hers–they’re so darling, and surprisingly cool. 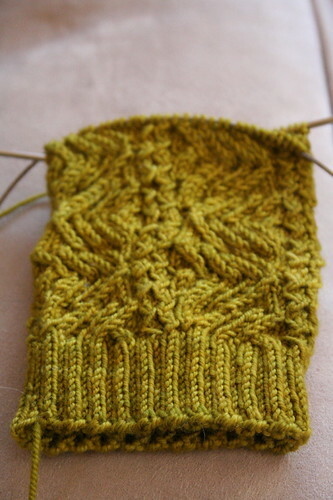 looks like you need some simple stockinette socks! 🙂 the vest is beautiful!!! Love your color subs – I’m not a fan of teal either, but I love the shades of blue. lots of beautiful stuff on the needles! i love those drunken bee socks. I can see how you’re having purse-knitting problems! Maybe you need to start a stockinette sock? I like the color changes you made for the vest! It’s going to be great! I most certainly do NOT think you’re an idiot. Reason #1: I haven’t even STARTED my second sock. And #2: Um, Ivy League Vest? Yeah. Idiots knit those all the time. I’m sorry the chart’s giving you such headaches — but it really is looking lovely. That ILV is gorgeous! Great color choices. 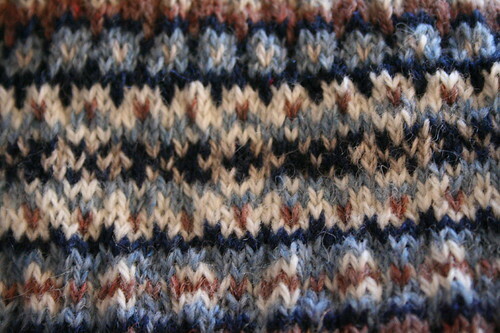 I love the corrugated ribbing on your beautiful vest – those gorgeous colors just peeking through…love it!! I think those wool soakers are adorable! And your Ivy league vest is stunning. The vest is gorgeous, but yes Eunnie has a thing for the purled fake seam……I don’t care much for that part of her patterns. But your vest looks wonderful. Maybe I can help you with the sleeves of Beatrix’ cardigan. 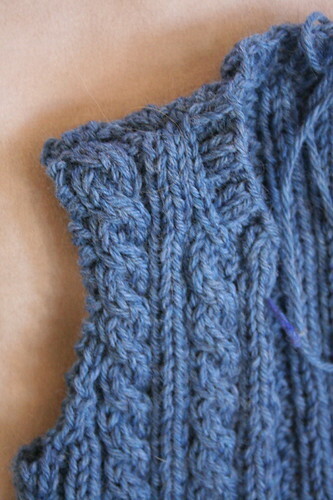 When I did my white cardi I used the book “Knitting in the old way” to do short row sleeve cap shaping. If you have access to the book it is on page 115 (try the library). Then you can visualize the sleeve as you go. It worked great for me, and one perk, less finishing! You see, you pick up the stitches on the shoulder as you go and then work your way to the cuff …. in the round!!!!! It’s great. well, just a thought anyway. Good luck with it! Thanks for the comment! I love your start on the Ivy League Vest, and the substitution of blues for the greens is really beautiful. I have to agree 100% with Jenna. Socks/knitted toys/baby items tend to make the best purse knitting for me. I have not found an answer to the too complex/too boring dilemna – if I do I will surely let you know! Your WIPs look great! Seems like you have a nice amount of variety both category and difficulty wise. ILV looks amazing. The diaper soakers are cute! Most people might find them boring, but I think they are adorable, and you’ll probably see me knitting up a storm of them once I have kiddies as well. That little soaker is just so cute. Seriously. Of all my knitting projects, none of them are (I feel) “on the go” projects. Okay, one of them is, but I am so over socks right now. Your vest is looking pretty great! Oh, those are all lovely! Esp. the fair isling. Does B find the Lamb’s Pride itchy? Just wondering. Wow! I love the Ivy League Vest — I’ve been looking at that one, too! I struggle to find on-the-go projects, too, so I can knit without getting bored. I am very intrigued by the wool diaper cover! So you are using cloth diapers for her? Wow, I’d love to do that but have no idea where to start. Wow, that Drunken Bee looks fantastic in that color! I love it! And your Ivy League Vest is looking great too! The Ivy League vest is gorgeous – love it – have been thinking of it but not so keen on the fair isle. Thanks for visiting my blog & the nice comment. Wow, you’ve been knitting up a storm! Your Ivy League is looking fantastic. I think any concerns you have about decreases around the purl seams will block out. I love your color changes. They all look so beautiful. I cant wait to see how the baby jacket turns out too. The vest looks awesome in those colors too. I’m with you on the anti-teal feelings; your color choice is great! And it looks like it’s coming along quickly, too! The colours on your ILV are so pretty..Nice colour comibination. I can totally relate! Most of my knitting time comes when I am sitting at someone’s house, chatting over a cup of coffee. None of my friends are knitters, so they get touchy if I appear to be ignoring them while I knit. That means I have to carry something that requires very little thought on my part. One of these days I’m going to lock myself in a closet and knit something really cool!